File conversions from one format to another industry accepted standard can be performed. These formats must be clearly defined up front and cannot change afterwards, unless a new request at additional cost is received. 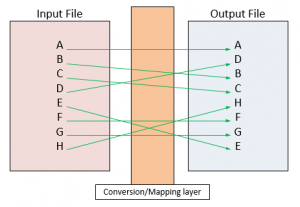 The file conversion layer is either created at the customer or at destination and is outside the file transfer process. Preference would be at the customer as each may have a unique requirement that needs to be fulfilled and that would also simplify the process and prevent multiple of these instances of conversions at destination.